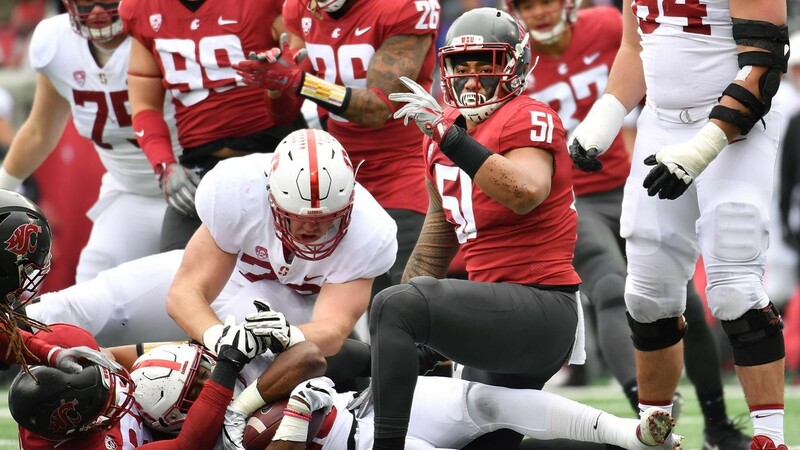 Washington State's defense, with linebacker Frankie Luvu (51) — one of 20 seniors taking the field at Martin Stadium for the final time — leading the way, held Stanford standout Bryce Love to a season-low 69 yards on 16 carries. Washington State's 20 seniors went out on a winning note. Eastern Washington came up short at home, as, inexplicably, did the Seahawks. Idaho lost a game and likely its senior leader, and Whitworth joined the Cougars in celebrating a quarterback milestone. Luke Falk got "giveth, then taketh away" backward Saturday at Martin Stadium: his off-target throw late in the third quarter turned into Bobby Okereke's 52-yard pick-six, giving Stanford a 21-17 lead. But Falk, playing in his final home game, redeemed himself in the fourth quarter, orchestrating a masterful 11-play, 95-yard drive, capped by a 11-yard pass to Jamire Calvin that proved to be the game-winner in Washington State's gutsy 24-21 victory over the then-No. 21 Cardinal, as the Cougs improved to 8-2, 5-2 in Pac-12 play, knocked Stanford (6-3, 5-2) out of first place in the North Division, and finished 7-0 at home for the first time in school history. Falk completed 34 of 48 passes for three touchdowns, and his 337-yard effort gave him 13,801 passing yards in his career, pushing him past Oregon State's Sean Mannion into first place all-time in the Pac-12. The Cougars' defense came up huge against Stanford's Bryce Love, who entered Saturday averaging nearly 200 yards per game; Love raced 52 yards for a touchdown at the end of the first quarter, but on his other 15 carries, a swarming WSU defense held him to just 17 yards. The Cougs, who jumped six places to No. 19 in this week's AP top 25 poll, hit the road for their last two regular-season games, starting Saturday at Utah (5-4, 2-4), followed by the Apple Cup in Seattle on Nov. 25, with the real possibility of the North Division title at stake. For the first time since 2009, Weber State came to Cheney and hung a loss on Eastern Washington. Saturday's 28-20 final, the Eagles' second straight Big Sky loss after a 12-game conference winning streak, ended Eastern's hopes for a second consecutive conference title. It's unusual when Eagles standout Gage Gubrud isn't the best quarterback on the field, but that was the case on Roos Field's red turf, as Wildcats dual-threat QB Stefan Cantwell completed 21 of 31 passes for 230 yards and three touchdowns and ran 12 times for 66 more; Gubrud connected on 22 of 42 passes for 239 yards, a touchdown and an interception. Eastern (5-4, 4-2 Big Sky), which slipped 10 places to No. 21 in this week's FCS Top 25 coaches' poll, visits North Dakota (3-7, 2-5) on Saturday. Last season, the Eagles and Fighting Hawks tied for first place in the Big Sky with 8-0 records. The Eagles will make the trip to Grand Forks, North Dakota, without Gubrud and another starter, junior linebacker Kurt Calhoun, suspended one game each by head coach Aaron Best for violating team rules after an incident involving Cheney police on Saturday night. Redshirt freshman Eric Barriere, who has played against Texas Tech, Fordham and Sacramento State this season, throwing two passes in the season opener against the Red Raiders — completing one for 13 yards and tossing the other for an interception — will make his first start at quarterback for Eastern. Some losses hurt more than others, and this one certainly qualifies. Not only did Idaho fall 24-21 at Troy on Thursday, there's a decent chance that Vandals senior quarterback Matt Linehan likely saw his carer come to an end. Linehan, who suffered an injury to the thumb on his throwing hand, completed 23 of 34 passes for 282 yards and two TDs in what may have been his final game. He moved into second place all-time at Idaho with 10,772 yards, just 52 shy of Doug Nussmeier's record. The Vandals (3-6, 2-3 Sun Belt), must win their final three games — at home against Coastal Carolina and on the road against New Mexico State and Georgia State — to have any chance of playing in a bowl game in back-to-back years for the first time in the program's history; that quest begins next Saturday at the Kibbie Dome against the Chanticleers (1-8, 0-5), who nearly pulled off the biggest upset in the program's history at Arkansas, but lost 39-38. It's 10,209 yards of total offense and counting for Whitworth's Ian Kolste, with one regular-season game left to play. 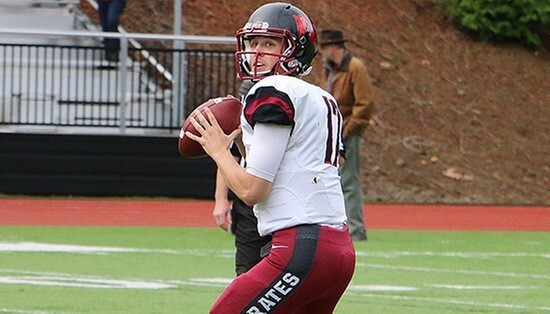 Despite playing on a sprained ankle, Ian Kolste staked his claim as the best quarterback in Whitworth history Saturday in Portland, throwing for 395 yards in the Pirates' 48-7 rout of Lewis & Clark and entering the school's record books as the only Whitworth QB to reach 10,000 yards of total offense in his career. Kevin Thomas caught six passes for 141 yards and a touchdown, while Mason Elms' 122-yard effort included a 96-yard scoring run, the longest in school history, as the Pirates improved to 7-2, 4-2 in Northwest Conference play. Whitworth hosts Willamette (0-8, 0-6) on Saturday at the Pine Bowl in the regular-season finale. Yes, Seahawks kicker Blair Walsh missed three first-half field goals, but head coach Pete Carroll's poor clock management in the game's final minutes also played a major role in Seattle's ugly 17-14 home loss to Washington. Make no mistake, this ranks among the worst losses of the Pete Carroll era, and a defeat that could be sickening come late December. For all of his undeniable success over the past seven-plus seasons, one thing has become clear: the Seahawks' success could be even greater if not for Carroll's — the buck has to stop with the head coach — too-frequent inability to manage late-game situations, as was the case yesterday at the Clink. Carroll's poor clock management down the stretch cost the Seahawks critical seconds — as many as 20 — as the clock ticked down to zero. And Russell Wilson, though he was trying to make something happen, should have spiked the ball, killed the clock and given his offense (at least) two snaps, not just one, in the waning seconds, with a chance to kick a field goal and force overtime. But it never should have gotten to that point. Blair Walsh, who had been nearly automatic through seven games, kicking 12 of 13 field-goal attempts, yanked first-half attempts of 44, 39 and 49 yards to the left, denying the Seahawks nine possible points on Sunday in a soul-crushing 17-14 loss to an inferior, injury-riddled Washington Redskins team. Seattle, now 5-3, trails the 6-2 Rams, who destroyed the Giants 51-17 on Sunday, by a game in the NFC West. The Seahawks won't have long to lick their wounds; they visit another division rival, the 4-4 Cardinals, on Thursday night. Arizona won 20-10 at San Francisco on Sunday, handing the winless 49ers their ninth defeat.